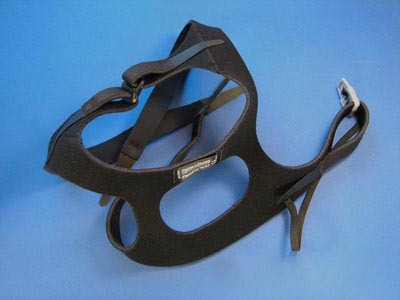 This is the headstrap for the Fisher & Paykel HC-431 full face mask with Stretchgear™ Headgear Deluxe mask suspension system. This is a special elastic headgear segment that maintains an equal mask force when the head tilts up or down. Mask is good for mouth breathers. I was due for new head gear for my Cpap mask. Most other sites charged more but I was pleased to find this site and got what I needed at a better price!! My new head gear arrived promtly and I am sleeping like a baby again!! Thank you so much!! I received this product in just a few days very pleased with your service, quality and the bargain prices. Thanks very much and will do business with your company again in the future. received the headgear as ordered. perfect fit and i received it in about 5 days. great service and the price is right.If the medical profession would offer the reasonable prices and good service that your company does, heath care would not be in the crisis that it is. thank you. I am retired military on Tricare Health Insurance. I was told I had to do a referall and bring my mask to the parts supplier, then have them refit my mask, etc, all just because the strap wore out. I found this site and ordered the strap; saved myself the $50.00 co-pay, time, and red-tape. Strap arrived within days, and is exactly the same as original equipment. I will definitely use this site for parts FIRST before using TRICARE. Thanks for providing such a useful service! This is the greatest. This is BETTER than the original that comes with the CPAP! The bands are wider, thicker and have a much more natural fit without leaving marks the next morning.